An Egyptian isolate of Spodoptera littoralis nucleopolyhedrovirus (Spli NPV) was tested for its potential as biocontrol agent in comparison to Autographa californica multiple nucleopolyhedrovirus (Ac MNPV). Comparative assays of Spli NPV and Ac MNPV against 2nd instar larvae of Spodoptera littoralis revealed 4-fold greater susceptibility of S. littoralis to Ac MNPV than to Spli NPV based on LC50 values for the two viruses. The LT50s determined for Spli NPV and Ac MNPV using LC50 of the virus against 2nd instar larvae were 4.2 and 5.8 days, respectively. A DNA segment of 405 bp containing highly conserved region from polyhedrin gene of Spli NPV (Polh-cr) was successfully amplified by PCR. Subsequently, this DNA segment was cloned and sequenced. Nucleotide sequence and its deduced amino acid sequence were compared to all available sequences in GenBank. Sequence alignment results revealed that Polh-cr showed significant similarities with 91 different baculovirus isolates. The percentage of homology ranged from 78% for Plusia orichalcea NPV to 99% for Spli NPV. This highly conserved region provides a candidate that could be used in easy, fast and economic prospective systems for virus detection as well as in biological control strategies. Baculoviruses are considered to be the largest and most broadly studied insect viruses. Although they infect over 600 species of insects , individual isolates normally show a limited host range and infect only closely related species. It is believed that baculoviruses are potentially useful as safe biological control agent and in some cases they were used successfully to control different insect pests [2–4]. However the overall use of baculoviruses for biological control is limited compared to other pest control means [3, 5]. This is due to the virulence and speed of action, as related to dose, host range, cost of production and patent registration are important effectiveness-determining properties of insect-pathogenic biocontrol agents. Baculoviruses were not only isolated from the insect orders Hymenoptera, Diptera and Trichoptera, but also were isolated from the crustacean order Decapoda (shrimps) . Furthermore, some NPVs (Penaeus monodon-NPV) are considered as serious pests for marine crustaceans . The infection of marine crustaceans (shrimps, prawns, crabs, eustacosa...etc.) with NPV will reduce their economic value and thus negatively affecting the national income. This problem will arise in countries that depend on marine wealth as a source of national income and/or where marine crustaceans are a major in most of the peoples' food (Australia and Far East nations like Japan, China, etc...). 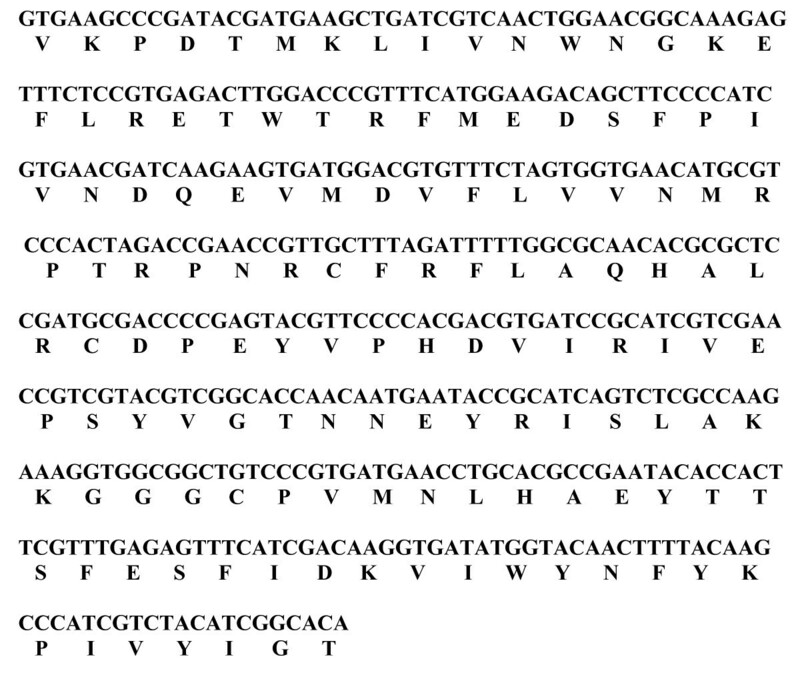 Although, the shrimp viruses have now been classified as Nimaviridae in the genus Whispovirus and are no longer baculoviruses , their diagnosis by PCR using primers of the polyhedrin and DNA polymerase genes of Autographa californica nucleopolyhedrovirus (Ac MNPV) and Lymantria dispar nucleopolyhedrovirus (Ld MNPV) was confirmed by Hsu et al. (2000). For the above mentioned reasons, many authors were interested in developing an accurate and easy diagnostic method to detect baculoviral infection in larval shrimps as well as insects [9–13, 7, 14–19]. Because baculoviruses are of great interest and utility to a large cross-sections of agricultural and biomedical research community, selection of some isolates with natural improved characteristics and definitive characterization of them have appeared recently. Consequently this piece of work will help in viral epidemiology, in monitoring the viral dissemination after field application and in risk assessment studies. Therefore, the main objective of the present work is to obtain a sequenced highly conserved DNA fragment from our NPV isolate to be used in an easy, fast and economic prospective system for virus detection. Also, this DNA segment can be used for developing kits of ELISA, hybridization, Western and dot blotting. Furthermore, our NPV isolate may be useful as potential biocontrol agent in programs of integrated pest management (IPM). Laboratory colony of the cotton leaf worm, Spodoptera littoralis, was originally collected from Giza, Egypt and maintained in the insectary of Agricultural Genetic Engineering Research Institute (AGERI) under highly controlled conditions from 1990 to date. The colony was maintained in the laboratory according to the technique described by El-Defrawi and coworkers . Larvae were reared on a semisynthetic diet described by Levinson and Navon . This colony was kept at 25 ± 2°C, 65–70% RH and natural photoperiod. These insects were used for viral propagation and bioassays. An NPV isolate was selected from thirteen Egyptian baculovirus isolates from different geographical localities during 1996–2000. This isolate was studied in detail to determine its insecticidal activity compared to Ac MNPV. In addition, a highly conserved region of polyhedrin gene was amplified, cloned and sequenced for further investigations. The selected isolate was collected from an Egyptian field located at Khorshid, Alexandria. It was isolated during Jan, 1999 from a S. littoralis larva on cabbage plants. This isolate was successfully propagated, purified following the method described by Lacey and coworkers  and used for further studies. A virus stock of NPV from Autographa californica nuclear polyhedrosis virus (Ac MNPV; E2 strain) was originally obtained from Prof. Dr. Suzanne Thiem, Department of Entomology, University of Michigan, was used in the bioassays as a reference in comparison to our isolate. Laboratory bioassay tests were conducted using highly purified virus suspensions. The Spli NPV and Ac MNPV isolates were tested against 2nd larval instar from the virus-free rearing culture in the laboratory. The concentrations were measured using Thoma haemocytometer and light microscope . Bioassays were performed using five concentrations of each virus isolate. Tested larvae were starved for 8 hours prior to feeding viruses. Serial dilutions of each tested isolate were prepared beginning with the following stock concentrations in PIB/ml: 7.8 × 104 and 9.4 × 104 for Spli NPV and Ac MNPV, respectively. Bioassays were carried out in plastic cups measuring 15 cm diameter × 10 cm height and containing a layer of 1 cm semi-synthetic diet. The viral suspensions were dispersed on the diet using micropipette (25 μl suspension/larva). Forty larvae were used for each concentration of virus and control. The control larvae were fed on diet treated with distilled water. All treatments were kept at 25 ± 2°C and normal photoperiod. The experiment was replicated thrice for each virus isolate and control. Mortality was recorded on the 7th day post-infection then corrected according to Abbott's formula . Cumulative mortality was recorded daily and the experiment was stopped on day 10 post-infection. Mortality was corrected according to Abbott's formula . Probit analysis of mortality data from bioassays was conducted using SPSS (ver10.0) computer software (SPSS for Windows, SPSS Inc., 1997). The LT values for the tested isolates were derived from analysis of data on the progression of mortality of S. littoralis larvae, following exposure to the LC50s dosage using probit analysis modified for multiple observations over time  and Mathematica software (Wolfram, Champaign, IL). PCR amplification was performed according to Saiki and coworkers  with minor modifications. Total DNA was extracted from the NPV isolate and the DNA segment was amplified using two primers designed based on conserved nucleotide sequences of ten different polyhedrin genes . The forward primer: GG(GT) CC(GT) GGC AAG AAT CAG AA and the reverse one: GCG TC(TG) GG(TG) GCG AAC TCT TT(TG) ATT TT. Total reaction volume was 50 μl which contained 1× PCR buffer (Promega), 1.5 mM MgCl2, 200 μM dNTPs, 2.5 U Taq DNA polymerase (Promega), 100 ng of each primer and 30 ng of template DNA. The amplification program used was 3 min at 94°C (hot start), 1 min at 94°C, 2 min at 55°C and 2 min at 72°C for 35 cycles followed by one cycle of 72°C for 7 min. PCR amplification was carried out in a DNA thermal cycler (Model 380 A, Applied Biosystems, CA, USA). The positive PCR products were visualized and eluted from the gel using GenClean Kit (Invitrogen Corporation, San Diego, CA, USA) as described by the manufacturer. The purified PCR products and a p GEM-T vector (Promega Corporation, Madison, WI, USA) were mixed in a 5: 1 (insert: vector) molar ratio and ligated using T4 DNA ligase (as described by the manufacturer). Ligation mix was used to transform competent Escherichia coli JM109 cells (Stratagene, La Jolla, CA, USA). White colonies were screened using PCR as described earlier in this section. Only one clone pG NPV-95 was selected and sequenced using M13 universal forward and reverse primers. Sequencing was performed using T7SequencingTM kit (Pharmacia, Biotech) and model 310 automated sequencer (Applied Biosystems, Foster City, CA, USA). Analysis of nucleotide and deduced amino acid sequences was carried out using EditSeq-DNAstar Inc., Expert Sequence Analysis software, Windows 32 Edit Seq 4.00 (1989–1999) and ExPasy database on the internet. Blast search for alignment of the obtained sequence with the published ones was done using database of National Centre for Biotechnology Information (NCBI). The cloned DNA fragment (Polh-cr) was deposited in GenBank under the AY442260 accession number. During the present study, the most promising isolate, as a biocontrol agent (based on LC and LT values), was selected from thirteen Egyptian baculovirus isolates. Through four visits to the location, out of 63 collected S. littoralis larvae, 18 larvae were diseased (showed symptoms of viral infection). The virus was diagnosed using light microscope, propagated in a S. littoralis laboratory colony, purified and kept at -80°C for further studies. Table (1) presents the LC and LT values for the two tested isolates (Spli NPV and Ac MNPV). It is clear that the newly molted 2nd larval instars of S. littoralis were susceptible to the applied concentrations. Based on LC50 in PIB/ml, our Spli NPV isolate was significantly (4-fold) less active (LC50 = 1.2 × 103) than the reference strain Ac MNPV (LC50 = 3.7 × 102). Although LC25 and LC95 of our isolate were approximately 2 and 8-fold lower than that of Ac MNPV, there were substantial overlap in the 95% confidence limits of the two viruses. Time to death showed some dependence on the initial concentration. Furthermore, it was observed that the highest peak of mortality was on 4–6 days post-infection. The progression of mortality in 2nd instar larvae of S. littoralis over a 10-day-period following exposure to LC50 dosage of the two viruses was analyzed to produce LT values (Table 1). Probit analysis of the LT values revealed that the decrease in LT values in favour of our isolate against Ac MNPV was not significant. Despite the overlap in the 95% confidence intervals of the two viruses, LT95 of our isolate was nearly 4 days less than that of Ac MNPV (95% c.i. 9.7–25.4 days, X2 = 2.64, DF = 8, P = 0.96, slope = 3.49 ± 0.74). Two oligonucleotide primers were designed to amplify 537 bp within the open reading frame (orf) of polyhedrin gene  and were successfully used in PCR. PCR analysis of our results revealed that a DNA fragment of only 405 bp was amplified within the orf (beginning about 78 – 81 codons after the starting codon, AUG) of the Spli NPV-95 polyhedrin gene (Fig. 1, lane 5). 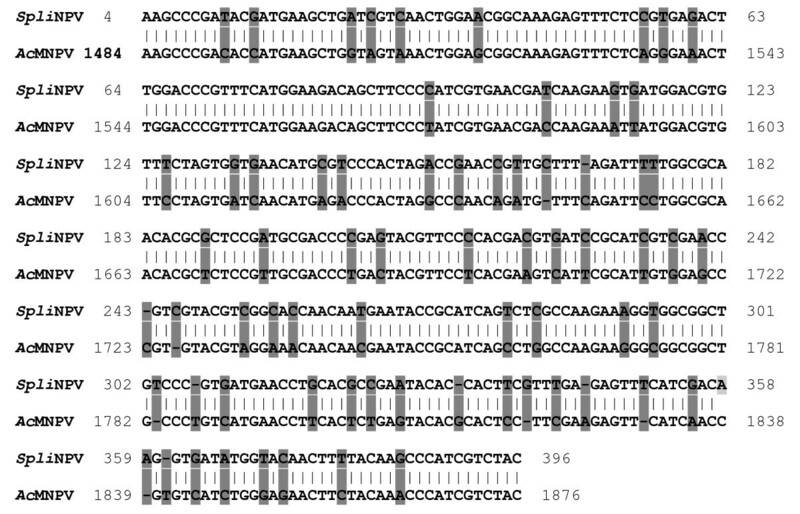 Subsequently this DNA segment was cloned into p GEM-T vector (Fig. 1, lane 2) and transformed cells were tested with PCR using the same primers (Fig. 1, lane 6). Using this screening method, clone p GNPV-95 was tested as positive (Fig. 1, lane 6). 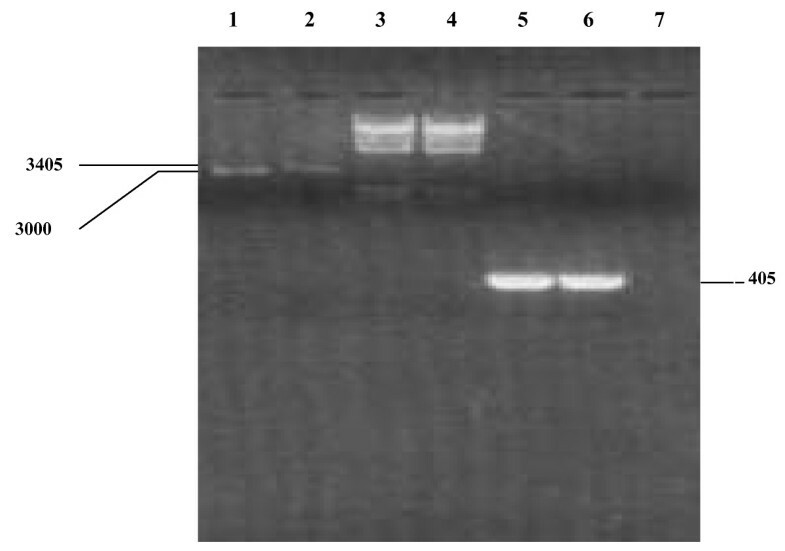 Agarose gel electrophoresis showing clone p GNPV-95 after linearization with Nde I, and PCR confirmation. Lanes 1 and 2 show p GEM-T and p GNPV-95 after digestion with Nde I, respectively. Lanes 3 and 4 show Lambda DNA/Hind III Marker. Lanes 5, 6 and 7 show the 405 bp amplified DNA segment from Spli NPV (as positive control), from E. coli harbouring p GNPV-95 and PCR mix without DNA (as negative control), respectively. The size of the bands is shown in bp. The nucleotide sequence of Polh-cr and its deduced amino acid sequence are shown in Fig (2). A single open reading frame (orf) that could encode a polypeptide of 135 amino acids was detected. No stop codon was found all over the sequence. This deduced polypeptide contains 16 strongly basic, 16 strongly acidic, 46 hydrophobic and 34 polar amino acids. The calculated molecular mass of the putative polypeptide is 15.92 KDa. Isoelectric point (PI) is 7.242 and the charge at pH 7.0 is 0.331. 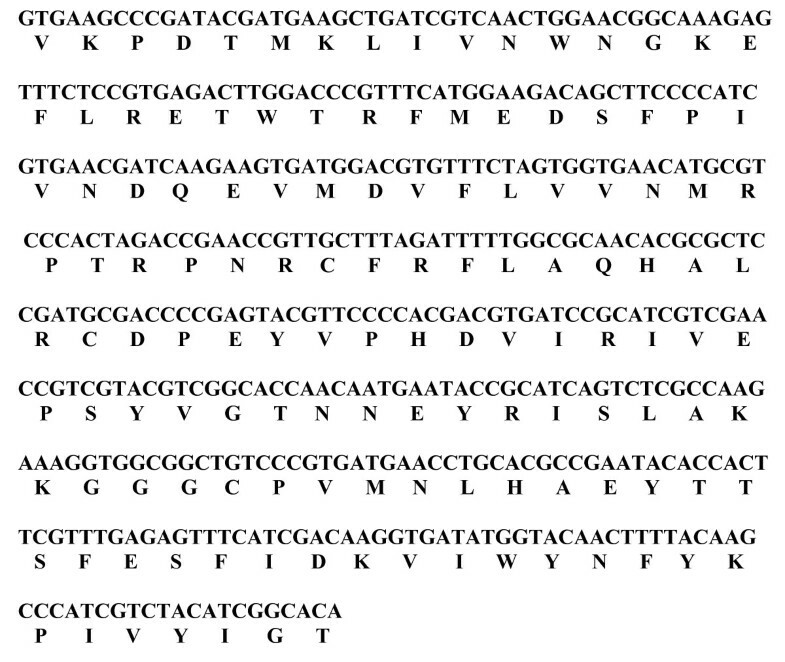 Nucleotide and corresponding deduced amino acid sequence of a highly conserved region of polyhedrin gene (polh-cr). The nucleotide sequence of Polh-cr was blasted in GenBank database and compared to all available sequences. Alignment results revealed that Polh-cr has significant alignment with 111 baculovirus isolates (100 NPVs and 11 GVs). The percentage of homology ranged between 99% for Spli NPV (Acc# D01017) and 78% for Plusia orichalcea NPV (Acc# AF019882). Interestingly Polh-cr produced significant alignments with 11 granulovirus sequences. This may raise the question of possible homologous recombination between NPV and GV species. Comparing Polh-cr nucleotide sequence (Acc# AY442260) to its corresponding sequence of Ac MNPV (Acc# M25054) as a reference, 82% homology, 57 different nucleotides and 12 gaps were observed throughout the compared DNA segments (Fig 3). Comparison of Polh-cr nucleotide sequence (Acc# AY442260) to its corresponding sequence of Ac MNPV (Acc# M25054) as a reference. Gaps and different nucleotides are shaded. The deduced amino acid sequence was compared to all other polyhedrins in GenBank database. Alignment results showed that the percentage of homology of Polh-cr ranged between 100% for S. littoralis polyhedrins (Acc# AAC33752 and AAR04375) and 81% for Attacus ricini polyhedrin (Acc# P31036). 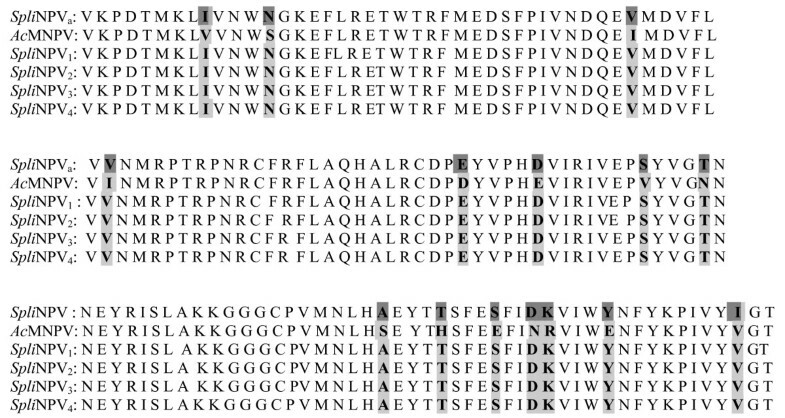 On comparing amino acid sequence of the putative polypeptide of Polh-cr (Acc# AAR04375) to its corresponding sequences of Ac MNPV (Acc# AAA46736) and other 4 Spli NPVs (Acc# AAW49208, BAA00824, AAT10182 and AAW49207), 15 different amino acids were observed throughout the compared putative polypeptides using Ac MNPV as a reference (Fig. 4). It is note worthy to mention that all Spli NPVs amino acid sequences (Acc# AAW49208, BAA00824, AAT10182 and AAW49207) were identical to Polh-cr putative polypeptide (Acc# AAR04375) except for the position 133 (I a.a. was replaced with V a.a.). 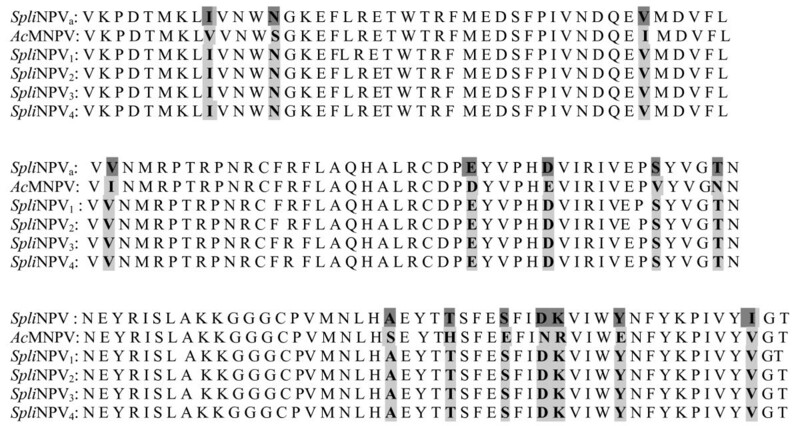 Comparison of amino acid sequence of the putative polypeptide of Polh-cr (Acc# AAR04375) to its corresponding sequences of Ac MNPV (Acc# AAA46736) and other 4 Spli NPVs (Acc# AAW49208, BAA00824, AAT10182 and AAW49207, respectively). The different amino acids were bolded and shaded using Ac MNPV as a reference. Phylogenetic analyses have been performed on the Polh-cr nucleotide seuquence and its deduced polypeptide and results of these analyses are shown in Figs. (5 and 6). In case of Polh-cr nucleotide seuquence, a phylogenetic tree was generated from sequence data of 38 NPV isolates by neighbor-joining distance analysis with maximum sequence difference 0.75 (Fig. 5). The topology shows four distinct lineages including 5, 21, 8 and 4 NPV isolates, respectively. The maximum nucleotide sequence divergence was exhibited in lineage II. 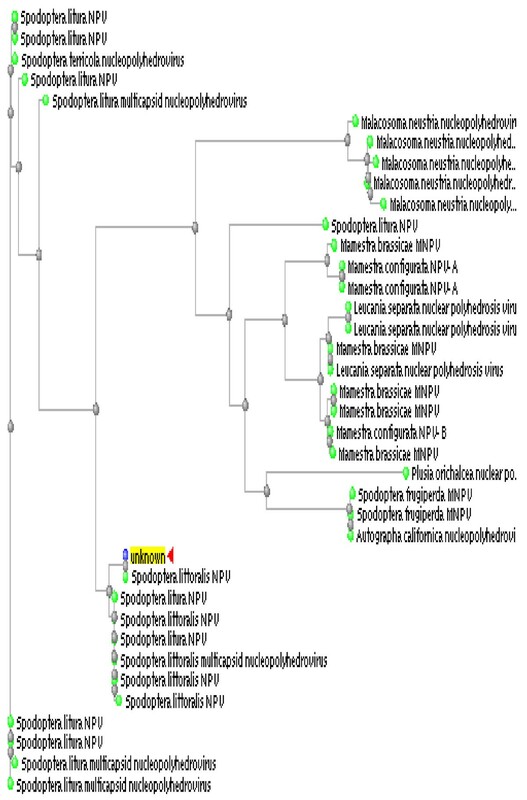 Meanwhile, the NPV isolates appear in the other three lineages as monophyletic sister clades (Fig. 5). In case of Polh-cr deduced amino acid seuquence, a phylogenetic tree was generated from sequence data of 102 NPV isolates by neighbor-joining distance analysis with maximum sequence difference 0.75 (Fig. 6). The topology shows three distinct lineages including 17, 60 and 25 NPV isolates, respectively. The maximum divergence of amino acid sequences was exhibited in lineage II. However, minimum divergence in case of the other two lineages was observed. 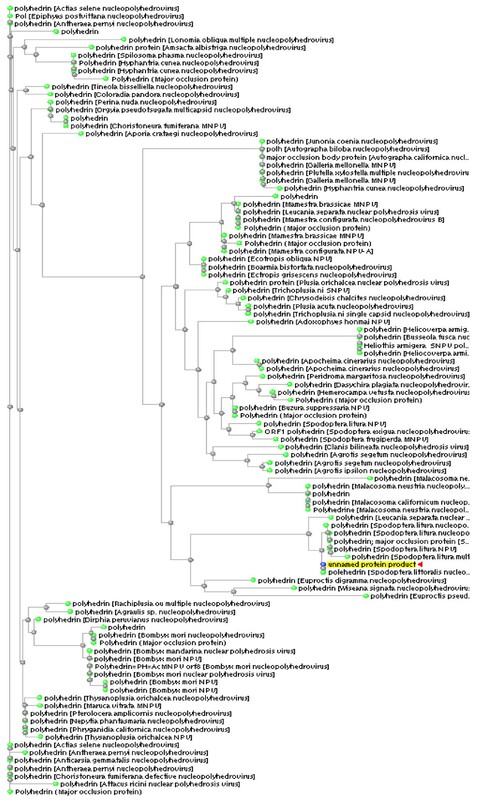 Otherwise, polyhedrins from many NPV isolates appear in monophyletic sister clades (Fig. 6). Phylogenetic analysis of Polh-cr nucleotide sequence compared to 38 published sequences. Unrooted tree was generated using ClustalW computer software. Full virus names are included in the tree. Phylogenetic analysis of Polh-cr deduced amino acid sequence compared to 102 published sequences. Unrooted tree was generated using ClustalW computer software. Full virus names are included in the tree. To date, genetically engineered baculoviruses introduce a promising research line to overcome the slow action of baculoviruses as biocontrol agents. On the other hand, searching for new natural baculovirus isolates with better insecticidal characteristics is still a developing subject of work (more safe and has not the risks of releasing genetically engineered product in nature). Although Ac MNPV is considered as the type species in the genus nucleopolyhedrovirus, 15 species and 471 tentative species of NPV have been isolated . Abul-Nasr  isolated an Egyptian NPV from the cotton leaf worm S. littoralis. Cherry and Summers  isolated the two reference NPV types A and B. During 1986 – 1988, six natural isolates of Spli NPV were isolated from Giza, Menya, Kaha, Tokh, Kafr-Elsheikh and Gharbyia, Egypt (Khamiss, personal communication). Also, fifteen isolates of Spli NPV were isolated from the six above mentioned Egyptian localities in addition to Fayoum, Sakkara, Menofyia, Benisuef, Asyut, Sinnuris, Banha, Sharkyia and Elsaff-Giza, Egypt (Khamiss, personal communication). Combining our data with that presented by Khamiss and by Seufi (personal communication), it can be concluded that 34 NPV isolates have been collected from Egypt between 1986 and 2000. This may reflect the suitability of the Egyptian environment for not only gathering and collecting new baculovirus isolates but also for using them as potential pesticides in integrated pest management (IPM) programs. Given that baculoviruses have been isolated from Upper as well as Lower Egypt, in which the cultivation was washed by chemical insecticides, it would be expected to find more and more isolates in virgin regions (where no insecticides were used). The susceptibility of 2nd instar larvae of S. littoralis to the two polyhedrovirus species reported in this study was comparable to that observed by Lacey and coworkers . They reported that LC50s were 1.77 × 103 and 3.05 × 103 occlusion bodies (OB)/mm2 for Anagrapha falcifera (Af MNPV) and Autographa californica (Ac MNPV) when applied to the neonate codling moth larvae. Our Egyptian isolate (Spli NPV) showed similar results to that obtained by Klein and Podoler against the Egyptian cotton leafworm . Abot and coworkers  clarified that LC50s of an NPV isolate against two A. gemmatalis populations varied from 129 to 316 OBs/ml diet. Their results fall within the range obtained with our isolate. On the other hand, our results showed lower LC50 when compared with that reported by Pawar and Ramakrishnan  and Komolpith and Ramakrishnan  whereas LC50 was 4.677 × 106 PIB/ml for 4-day old S. littoralis larvae. Similarly, Ashok and Ramakrishnan  reported higher LC50 (7.1 × 106 PIB/ml) for 3-day old S. litura larvae. Also, Stiles and Himmerich  introduced higher LC50 of Ac MNPV against H. zea (3.46 × 104 – 6.38 × 105 PIB/ml). Finally, Abdel-Aziz (personal communication) presented higher LC50s (1.8 × 107 and 9.0 × 107 PIB/ml, respectively) for 2nd larval instar of S. littoralis. The variability of LC50s is probably due to the method of surface treatment, homogeneously treated diet, feeding habit of the insect species  or due to difference in larval age [36, 37]. It may also be due to difference in host susceptibility to NPV , number of virions per occlusion body, virulence of the virus strain and/or the difference in number of laboratory propagation cycles for the viral isolate. According to Van-Beek and Huges , the virulence of baculoviruses is best determined by the speed with which a given virus kills the insect pest. LT values presented in Table (1) indicated that Spli NPV killed 2nd instar larvae of S. littoralis one day faster than Ac MNPV. In comparing our results with that presented by other authors, many considerations have to be taken into account. Host range and LC95s of the viral isolates are the most important considerations. Although LC95 and LT95 that produced in this study are economically prohibitive, improving the insecticidal characteristics of such isolates (by formulation and synergistic additives) is a growing subject in many companies. The full length of polyhedrin gene from lepidopteran NPVs ranged from 483 bp to 747 bp . In case of polyhedrin gene from Spodoptera sp. NPVs, its full length ranges from 510 bp to 747 bp in comparison to that from Autographa sp. NPVs which ranges from 507 bp to 738 bp . Therefore, it could be said that Polh-cr represented about 65% of the full length of polyhedrin gene. On comparing nucleotide sequence of Polh-cr to all available sequences in the GenBank, it created a significant homology with 100 NPV and 11 GV genes. It showed 99% identity with S. littoralis polyhedrin gene (Acc# D01017), 95% with S. littura polyhedrin gene (Acc# AY552474) and 93% with S. littura polyhedrin genes (Acc# AY549963, AF325155, AF037262 and AF068189). In addition, it was 90% similar to Lymantria dispar polyhedrin genes (Acc# AF499687, AF081810 and M23176), 88% to Malacosoma neustria polyhedrin gene (Acc# X55658) and 87% to B. mori polyhedrin genes (Acc# M10043 and X63614). Furthermore, it showed 86% homology with S. litura and Amsacta albistriga polyhedrin genes (Acc# X94437 and AF118850, respectively) and 85% with S. exigua and Malacosoma neustria polyhedrin gene (Acc# AF169823; AY127899 and AJ277555, respectively). These results ensured that Polh-cr is a highly conserved region within polyhedrin gene of about one sixth of the known NPV species. Consequently, it could be used in many molecular techniques concerned with baculoviruses. Knowing that the full length of polyhedrin protein from lepidopteran NPVs ranges from 161 a.a. (e.g. Hyphanteria cunea NPV, Acc# AAW49190 and Bombyx mori, Acc# ABB16300) to 249 a.a. (e.g. Spodoptera litura NPVs, Acc# AAZ78353, NP_258269 and AAS90121). In case of Spodoptera sp. NPV, full length of polyhedrin protein ranges from 170 a.a. (Acc# AAW49204) to 249 a.a. (Acc# AAZ78353) in comparison to Autographa sp. NPV which ranges from 169 a.a. (Acc# AAW63393) to 246 a.a. (Acc# AAA46736). The deduced amino acid sequence of Polh-cr was compared to other polyhedrins. Alignment results revealed that Polh-cr was 100% and 99% identical to S. littoralis polyhedrins (Acc# AAC33752, AAR04375; P24646, JU0382 and BAA00824, respectively). It was also 99% similar to S. litura polyhedrins (Acc# NP258269, AAC09246, AAL01689 and AAS58468). In addition, it has 98% identity with polyhedrin of S. littoralis (Acc# AA590121). Furthermore, it showed 89% similarity with polyhedrins of S. exigua and Ecotropis obligua polyhedrins (Acc# AAF33532, JQ1868, NP037761, 001586; AAB53632, AAQ88174, P07388 and AAA46739). Using Ac MNPV nucleotide sequence (Acc# M25054) and amino acid sequence (Acc# AAA46736) as references for comparison with our sequences, it was found that 57 different nucleotides and 12 gaps in nucleotide sequence resulted in 15 different amino acids in the putative polypeptide (I, N, V, V, E, D, S, T, A, T, S, D, K, Y and I a.a. from our putative polypeptide were replaced with V, S, I, I, D, E, V, N, S, H, E, N, R, E and V a.a. from Ac MNPV putative polypeptide, respectively). Surprisingly, Polh-cr putative polypeptide was identical to Spli NPV polypeptides (Acc# AAW49208, BAA00824, AAT10182 and AAW49207) with one amino acid replacement (I with V at the position 133). These results suggested the possible difference in codon usage among the compared isolates. It might also give a specific property to our putative polypeptide. Phylogenetic analyses of the Polh-cr nucleotide seuquence and its deduced polypeptide revealed that Polh-cr is genetically related to a large number of published nucleotide sequences and to a larger number of published amino acid sequences. This finding made it is preferred to develop kits that use viral protein (polyhedrin) in detecting NPVs because it will be wider-used than DNA method. In this paper, we described the cloning and sequencing of a highly conserved region in polyhedrin gene and the insecticidal activity of an Egyptian NPV isolate. To our knowledge, this is the first report that determines the sequence of this conserved region in an Egyptian isolate. Further studies to develop kits for ELISA, Western and dot blotting, hybridization as well as potential biocontrol agent are switched on. The availability of Polh-cr products would be helpful in studies concerning ELISA, PCR and other related molecular techniques. In addition, it provides a candidate for effective, sensitive and reproducible diagnostic tools for screening insects or/and other arthropods, especially crustacean species, crabs and shrimps for baculovirus infections and may be important in controlling (preventing/enhancing) baculovirus infection. Also, it may be useful in monitoring the distribution of NPVs, the fate of genes and release of wild type as well as genetically engineered NPVs. Furthermore, it will facilitate risk assessment, ecological and viral epidemiological studies.